What should I use, VeloPlugs, Rim Tape, or Rubber Rim Strips in new wheels? I'm building two new sets of mountain bike 26" wheels, and I'm wondering what to go with. Both are double walled rims, so in addition to the standard rim tape and strips, I can use a product like VeloPlugs. What are other points or guiding factors in selecting which to use? I'm not concerned with price and availability, I'll wait/pay for the best option. I'm leaning toward VeloPlugs for dual walled rims and rim tape for single walled. Furthermore, if anyone has used VeloPlugs before, how do you find the diameter of the spoke holes when the rim manufacturers doesn't publish it? Just wait until the rims are in hand and measure with a caliper? I just recieved veloplugs today for the wheels i am building and i must say that i like the design and the fit. I measured the holes inside the rim and they were exactly 8mm so i went with the same 8mm model plugs. If you dont know yours you will definetley have to remove your tire and tube and peel back the tape to get a good measurement. I weighed the tape used on my old rims and it weighed 36 grams from both. I forget the exact math but it was almost a full 30 grams i would be saving on rotational wheel weight and the fit actually gives me confidence to go with a lighter tube due to less concern of pinching on install with rim tape. When I bought the carbon 50mm wheels, I put on the yellow velo plugs. I had more plugs than necessary and I made sure the plugs fit snugly into each hole. Some plugs didn't. But I had enough plugs to choose from. Its been over 2 years and I have not experienced any loss of plugs. During those 2 years I had numerous punctures, front and rear and a change of tires as well. There are advantages to all of them, but tape has always been my preference. I've used velo plugs, but in my wheels the incidence of loss was too high. They lasted me less than a year, before I lost all the extras, and went back to tape. I don't use rubber rim strips because the rubber degrades, and they move around too easily. I prefer Schwalbe high pressure rim tape, because it gives a good seal, stays put, and sticks better than cloth tape like Velox, but still removes clean and easy when the time comes. You left out reinforced plastic/rubber type strips. Kore Chastity Belt strips are my favorite and rated for 140psi. Very durable. FSA, Origin8, etc also make this type, available in many common sizes. Price ranges from $2.50 - $4 each. I do like cloth tape, but the adhesive can dry out (even before purchase). Velox is $5 a piece at my shop. Rubber rim strips are junk in my opinion, definitely a last choice. They are commonly the cheapest and sell for $1 each at my shop. I've not heard anything bad about Veloplugs. Tire manufacturers recommend to change the rim tape each time you change a tire. Plastic rim tapes actually get damaged after a few thousands km under high pressure and I hate rim cloth that get soaked with water under rain. I have been using veloplugs for a year now and I am very happy with this system. Rim tape can actually slip, slowly, due to heat and/or mechanical stresses (rolling of the wheel, twisted tube), but would be my choice, since they're not elastic (accept high pressures well) and can't damage the tubes. 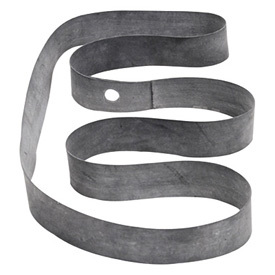 Rim strips are very fine, but their edges might become hard with aging, and I have had some flats due to cuts in the innertubes caused by these edges. Have never used plugs (actually didn't know they existed), so cannot tell about them. I use the veloplugs, but for touring and commuting I put a strip of vinyl electrical tape over the top of them so I don't lose plugs when changing tires. On a low pressure tire I don't have a big preference. Or you can use cheap plastic adhesive tape, usually two to five layers. It's cheaper and lighter than any of the above, but it doesn't last especially long. It helps if you de-burr and round off the edges of the spoke holes. After a while you will start getting punctures where the tape has given way and the tube gets cut by the spoke holes. I was surprised to find that even two layers worked in MTB tyres at ~60psi. When every gram counts this is what I've done. It also works as a desperate measure when you fix a flat and the existing fix is damaged. Rim tape also comes in plastic variants that are lighter, last longer and cost more than rubber ones. Often with tapered edges (you really only need it to cover the spoke holes), but they're still heaver than rim tape and costs more. In real life (rather than for one race) I use rim tape. It's cheap, easy to get, lasts ages and it works. Gorilla tape, cutting one half inch strip patch for each spoke? And then a rim strip or old inner tube made into a rim strip over that? 3M duct tape, 3 layers at least (cut to fit). Alternative: 3M super 88 electrical tape. Again layers of it. These are just poor mans solution in an isolated place but with a hardware store around. If you have good LBS stores nearby, get the best recommended. Velox. If you can't get it, go to medical supply store and get COTTON bandage tape; you'll have to cot your own valve stem hole. Veloplugs are lighter weight. Good for race setup. Not the answer you're looking for? Browse other questions tagged wheels rims wheel-building rim-tape wheelset or ask your own question. Are double walled rims worth the money? I'm perplexed, why is my cloth rim tape not sticking? Which spokes to get, Wheelsmith or DT Swiss Spokes? Disc brakes and single walled rims - is there something to worry about? Which rim tape size fits my bike? My rim exploded inflating on an automatic pump of a gas station. Should I reuse wheel's spokes/hub or buy everything new? How much will 4mm dish weaken the rear wheel?